It is a well documented fact that Mims and I are night owls. Please don't judge me too harshly that I occasionally let my 5 year-old stay up into the wee hours of the night with me. Jake works 2nd shift at his job and doesn't usually get home until two in the morning, so there isn't a big incentive to get up bright and early in the mornings, since we don't want to wake him up. So Mims and I had worked out a routine where neither of us got up before 9 am. I liked that routine. I miss that routine. So, we're getting up extra early to get to school on time, and it's totally worth it because Mims has a fantastic teacher this year that she adores. Which is why this post is extra early. Thank you, thank you, thank you to everyone who generously gave me their opinions about whether or not to open an online boutique to sell my samples. I think that the thought and consideration that you gave in your answers was priceless and incredibly valuable. I think that I may to a combination of things to see what is the most rewarding for me and my family. I am excited to be sharing this journey with all of you. I swear I tell everyone I meet that you guys are the kindest, most wonderful, funny and clever friends that I've ever had the joy to meet. The Dynamos Rule!!! I hope you have a wonderful, magical, super-duper awesome positive day and that the secret dream you hold in your heart comes true! I used Random.org this time to pick a winner. There were 18 comments (that weren't mine - LOL!). 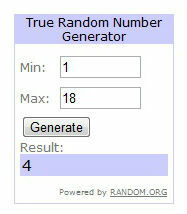 Congratulations to AuntyTeeni who was the winner! Email me your address (I'll contact you via email too!) and I'll get your pen out to you right away! Congratulations AuntyTeeni, God bless you. Your dad sounds a lot like what my dad was like when I was a teenager... I think it brought him great joy to wake me up at ridiculously early hours... LOL!!! LOL!! That got me laughing so hard that I couldn't catch my breath! I hope you don't find this as being a negative reply. I'm called Mrs. Safety. The pipe cleaner ideal is great. Just make sure not to use them on the little ones because they have wire in them. It is sharp and has a point that can hurt them very bad. Very bad for the eyes. Hi Mrs. Safety! That's a good point! Thanks for visiting!